With rain forecast blocked storm drains will create additional problems! Monday’s new storm could bring a mix of rain and snow overnight. With most of the county beneath a significant amount of snow, storm drains are covered too. Storm drains blocked with ice and snow can cause local flooding of roads and private property. The County and your local jurisdiction are working hard to clear roads as quickly as possible, but you can help reduce the chance of flooding in your neighborhood. Monitor neighborhood storm drains and keep them free of ice, snow and debris. This may mean clearing the drain repeatedly as snow falls, plows pass by, or ice builds up. Do not block storm drains with snow shoveled from your driveway. 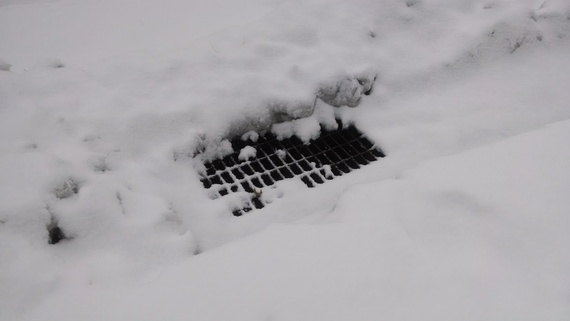 If the storm drain is blocked, use a shovel to clear the top of the grate, and break up and remove any built up ice. If this does not help, report the blockage to Kitsap1: 360.337.5777. NEVER remove a storm drain lid or attempt to clean a drain located in a busy street. Do not wade into water when you are unsure of the depth. "During large weather events like we are experiencing, we have crews out around the county to manage snow and minimize local flooding,” says Chris May, Kitsap County Stormwater Division Program Manager. “Residents can help by monitoring their neighborhood drains and contacting us if they see a problem." To report blocked storm drains or flooding issues in your area, call Kitsap1 at 360.337.5777 Leave a message if the offices are closed. Click the links below for more information about County resources.